Put summer in your basement and keep flowering through to February with the M-01 Hydrophonic Plant Grow Light Strip by OxyLED. 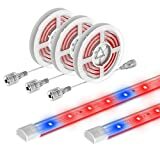 With 36 LED lights (27 red, 9 blue), the light strip creates optimal conditions for your potted pals to continue thriving even when natural conditions don’t offer enough natural light. OxyLED is an efficient and effective solution for hydroponic gardens, which will save you hundreds in energy costs over the years, as the entire unit powers on only 24W. OxyLED uses a combination of blue and red lights to emit specific wavelengths that stimulate plant growth. A light for all seasons, the OxyLED M-01 was built to last, with a lifespan of over 30,000 hours and IP67 water resistant that keeps it safe from any unwilling splashes with the watering pot. The fitting is also works brilliantly in both high and low temperature environments, making it a great addition for sheds, porches, and balconies that can’t get enough light. So no matter where you set down your roots, OxyLED will turn shade into sunshine leave your leafy friends looking their very best.